Potty training...not my favorite thing to do. I guess it would have been a bit more positive for me if it hadn't taken so long to train my daughter! I was the parent who would have their child COMPLETELY trained at age 2 (because she is sooo smart, ya know) , in a month or so. Well, here we are a year and a half later and she is just now potty trained. She still wakes up wet on occasion, but really does very well all things considered. The reward of a child who knows how to go potty on their own is wonderful...but I would say don't push them! If they aren't ready, you will only drive yourself crazy and they will become frustrated easily. People have asked me when I am going to start potty training my son and I just smile..."Sometime after he turns 2", I usually reply. One of the things I really hate about potty training is that potty chair. It gets so yucky if it doesn't get emptied right away and lets not even talk about what it can smell like some days!!! EEW! 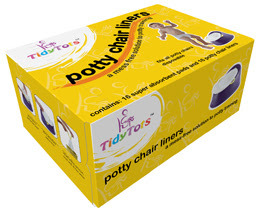 Tidy Tots™ disposable potty chair liners take the mess out of your child's potty training experience. No more dumping or pouring your little one's success into the toilet and then trying to clean and sanitize the potty chair for the next use. Tidy Tots™ will put an end to wiping out what is left behind and cleaning after your child's potty training session. Like I said, I had never heard of Tidy Tots before and as a mom of a potty training toddler, I was very interested to check them out. So, for this review I was sent a package of Tidy Tots to try. In each package you will find 16 potty chair liners and 16 absorbent pads. Basically, you have a small plastic bag with drawstrings and a super-absorbent pad that sits in the bottom of the liner. I had some misconceptions about this because at first I thought that all this product was was a plastic liner. It didn't make much sense but then when I received my package, it immediately made perfect sense! Thanks to the absorbent pad, the liquid is absorbed and there is really no mess. In a nutshell, here are my thoughts, pros and cons for this product. Pros: Disposable, no cleaning the potty bowl, easy to take on-the-go, very easy to install and affordable! Cons: Urine can get trapped in crevices of the bag and makes pulling the liner out interesting, sometimes scary for a little one to sit on, may not last very long if you have a toddler who potties alot! Tidy Tots can be purchased directly from their website, for $7.99. You can also find them through other sites...visit Tidy Tots to find out where! I would win these for my daughter, Ana :) we start toilet training soon..ugh..
hoping these would make it a little easier. I would win these for my daughter. We're kinda sorta starting to potty train. I would win these for my granddaughter.